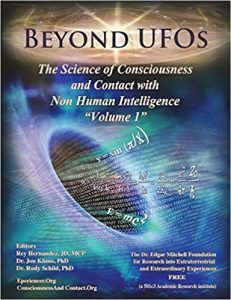 Beyond UFOs: The Science of Consciousness and Contact with Non-Human Intelligence, Volume I. Edited by Rey Hernandez, Jon Kilmo, and Rudy Schild. The Dr. Edgar Mitchell Foundation for Research into Extraterrestrial and Extraordinary Experiences. 2018. ISBN: 978-1721088652. 802 pp. Softcover, $29.95; Kindle, $19.95. This book is touted as the first comprehensive worldwide scientific investigation of individuals who have reported contact experiences with nonhuman intelligences. It is widely promoted to a movement of “experiencers” who believe that their experiences are real. The authors include many qualified social scientists, including four retired academics with PhD degrees. They report the results of qualitative and quantitative surveys of 4,200 individuals in 110 countries conducted in four languages (English, Spanish, German, and Slovak). The book is long at 802 pages and often repetitive, but this has the great merit of allowing the writers to report the quantitative results in detail and include extensive excerpts from the qualitative interviews. I was pleased to see that the study replicated the key finding of a much smaller survey I published in the Skeptical Inquirer in 1994, “Measuring the Prevalence of False Memories.” In that article, based on a small population survey, I reported that people who believed they had been contacted or abducted by UFOs were also likely to have experienced other kinds of unusual experiences, such as being visited by a dead relative, seeing a witch or a devil in their bedroom, or seeing a ghost. I interpreted this as false memory syndrome.